I have been on a blogging hiatus due to work activity but valentine’s day brought its own fair share of drama as Arsenal hosted Leicester in one of the most exciting games I’ve watched in a long while. The Foxes had been on the ascendancy with their string of historic victories but the Gunners knew that anything less than three points would have been absolutely disastrous for their title challenge. After picking up three points from a possible 12, the win against Bournemouth was a step in the right direction. The game was really intense with end to end football but there were concerns for Arsenal fans when Laurent Koscielny picked up a knock. With Gabriel Paulista already out for three weeks with a hamstring injury, Calum Chambers and Per Mertesacker are the only available defenders for selection. The first goal arrived in rather acrimonious circumstances as Jamie Vardy unleashed his inner Diego Costa to con the ref into getting a penalty when he tricked Nacho Monreal. 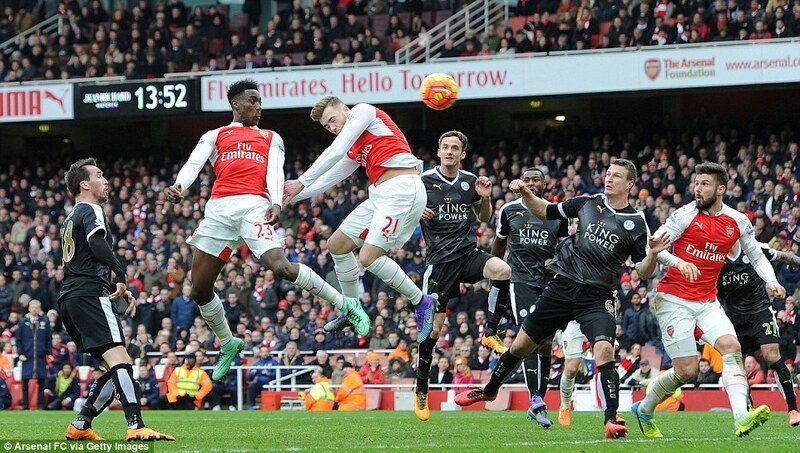 Monreal’s disappointment was evident was he watched Vardy fire the ball past Petr Cech. Francis Coquelin had to meet the Spaniard to motivate him because there was a lot of time to get it right. Arsenal’s cause was helped when Danny Simpson received his marching orders but Claudio Ranieri activated a defensive tactic that seemed impossible to breakdown. However, Arsenal’s pressure paid off when Olivier Giroud flicked the ball to Theo Walcott that wasted to time in placing the ball past Kasper Schmeichel. The Danish goalkeeper was a thorn in Arsenal’s flesh making save after save but in the end, Arsenal got the match winner when Ozil swung a killer ball that was headed home by Danny Welbeck. My elation knew no bounds and the feeling was mutual across the Goonersphere. With Arsenal beating Leicester, the title race has been thrown wild open, especially with Tottenham completing the double over Manchester City. “It’s been a long time off the pitch, the longest period of time that I’ve spent off playing matches in my career. It’s difficult, and with a few headlosses along the way. “It was a wonderful feeling to get that winning goal at the end. It was just very important for us to get the three points. With the type of game it was, it was close right until the end and thankfully we got the goal. “As soon as I saw Mesut line it up, I just tried to get myself into a nice position, in behind the line of defence. Thankfully it came in my direction and I got the right glance on it. He even got a yellow card for his troubles but we didn’t care. The Gunners had recorded a victory with the last touch of the game. Time to switch allegiances to the FA Cup before the visit of Barcelona. Posted on February 15, 2016, in Arsenal, Football, Match Report, Premier League and tagged Arsenal, Football, Leicester, Premier League. Bookmark the permalink. 1 Comment. Well done to the crowd for calling out the dodgy decisions (but not unexpected from Martin Atkinson) by the referee. He let many fouls and tugs on Arsenal players go unpunished, least of all Wes Morgan climbing on top of Ozil which should’ve led to Arsenal having a freekick near the Leicester goal rather than Vardy getting to tumble into Monreal without any initial contact by Monreal. I believe it’s the pressure from the crowd which led to the referee finally behaving a bit, although how he missed the knee high foul by Drinkwater on Ramsey is beyond comprehension. I hope the crowd do keep the pressure on any dodgy referees and we no longer get mugged by Refs like we were in the z Chelsea away and the Southampton home games!